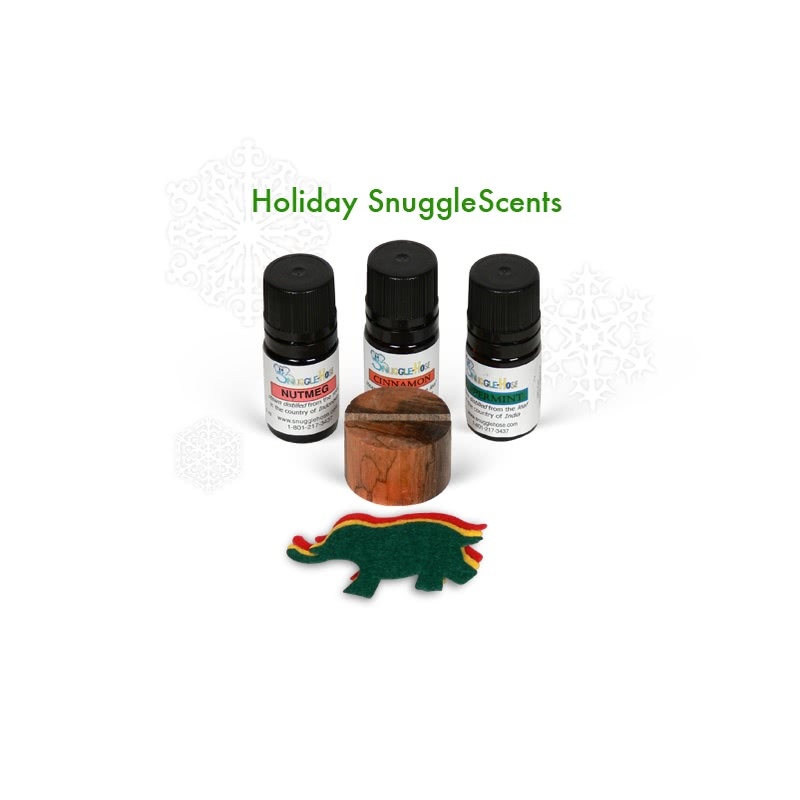 SnuggleScents Holiday Memories will remind you of peaceful nights next to the fireplace, sipping eggnog and help open your sinuses from the common winter colds. Each package comes with one 5ml bottle of Nutmeg, Cinnamon, and Peppermint. Dream sprinkling nutmeg into a steaming mug of eggnog or the smell of cinnamon cookies fresh from the oven or open your sinuses with the refreshing small of peppermint. 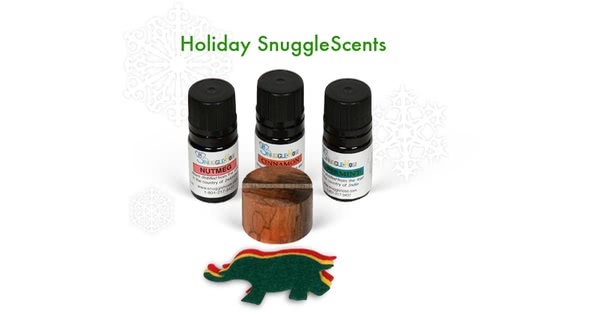 This assortment of all natural essential oils will remind you of the winter cold nights, snuggled around the fireplace. Place a couple of drops of essential oil on the elephant shaped diffuser pad, then place on the wooden stand in front of the air intake on your machine. One 5ml bottle of each Essential oil: Nutmeg, Cinnamon, and Peppermint. Nutmeg. Typically known as a food spice, Nutmeg has an underlying sweet, nutty aroma that produces a warm "awakening" sensation. Use Nutmeg when you are fatigued or need a calming fragrance. Fall asleep knowing you will awake to a feeling of renewed comfort, focus and energy. Cinnamon. Cinnamon is a spicy aroma with a sweet earthy smell that soothes the spirit and promotes relaxation. Use this oil to promote a healthy immune system or when digestion is a problem. Peppermint. Naturally mentholated, peppermint has an anti-inflammatory effect that soothes nasal passageways. The powerful menthol aroma is perfect for CPAP users who struggle with asthma, soar throats, congestion, headaches and colds. Why might I want to use Aromatherapy with my Machine? Pleasant smells induce strong feelings of calm, comfort, and relaxation. The sense of smell is part of the brain's emotional centers and cognitive distraction (the ability to exclude other distracting stimuli) is an important feature of human olfaction. Some people do not like the "machine" smell which can be delivered from the machine. The aromatherapy can help control the scent you smell when going to sleep. Some people tend to feel claustrophobic when using their CPAP. Having relaxing scents delivered through the machine can reduce the anxiety levels to reach a higher comfort level. CPAP Aromatherapy consists of a variety of different essential oils which are applied to the included diffuser pad and placed in front of the machine's air intake. You should not apply essential oils directly to the machine filter, because it would break down the machine filter. You should also not add the essential oil to the humidifier chamber water, because it can damage your humidifier chamber. Essential oils are derived from botanical elements (citrus, leaves, flowers, herbs, etc.) through a simple distillation technique. CPAP Aromatherapy only uses the highest, therapeutic-grade quality, 100% pure essential oils. All of the essential oils used in CPAP therapy are disclosed on the label. CPAP.com uses only those essential oils that are listed on the "Generally Recognized as Safe" for human consumption list maintained by the FDA. Please do not use this product if you have concerns about possible allergic reactions or other effects from exposure to essential oils. While essential oils are safe for human consumption, they are pure, undiluted and might cause irritation when applied directly to the skin or mucous membranes. It is strongly advised to keep essential oils out of the reach of children and please avoid all direct contact with eyes and mucous membranes. You should wash off essential oils with warm, soapy water. Is it safe to use essential oils all night? Indeed. People quickly become acclimated to the scents and research has shown that the olfactory sense basically turns off while you are asleep. You will smell the pleasant aroma when you need it the most; while relaxing and falling asleep and also again when you awaken. Remember, we are talking about extremely small quantities of aromatics (a little goes a long way) and all of the essential oils sold on CPAP.com are considered safe for human consumption by the FDA. Can aromatherapy work with my APAP, VPAP, BiLevel? 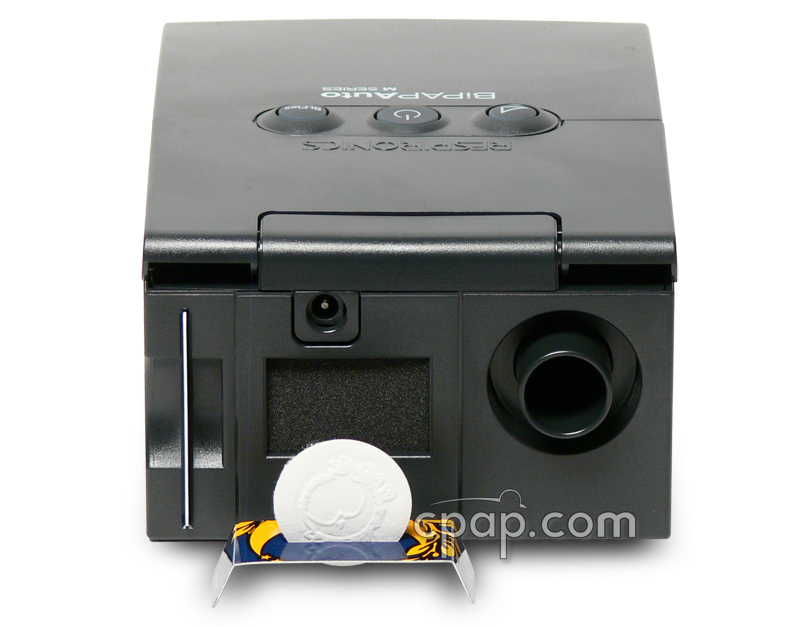 CPAP Aromatherapy is compatible with all CPAP and BIPAP machines. Aromatherapy releases a minute amount of fragrance into the air prior to being taken into your CPAP/BIPAP machine. Place the diffuser near the air-intake and turn your machine on. Can I use cotton balls? It is highly advised that you do not use any other materials besides the supplied Diffusion Pads, which are specifically engineered for use in the diffuser. There is a risk that any other materials may become dislodged or cause problems and the rates of diffusion could also differ if other materials are used. Can I re-use the diffusion pads? Diffusion Pads are made of durable fabrics and may be hand-washed and re-used. Simply wash with a mild detergent, rinse well, and air dry. Are these products approved by the FDA? The CPAP Aromatherapy products are not medications nor are they medical devices. They are considered "cosmetics" under the US Federal Food and Drug Act and related regulations. While there is certainly evidence that some essential oils might have a therapeutic value (for instance lavender oil potentially improving deep sleep), essential oils used for their aromatic qualities are regulated by the FDA as cosmetics. CPAP Aromatherapy products are in full compliance with FDA laws and regulations pertaining to cosmetics.